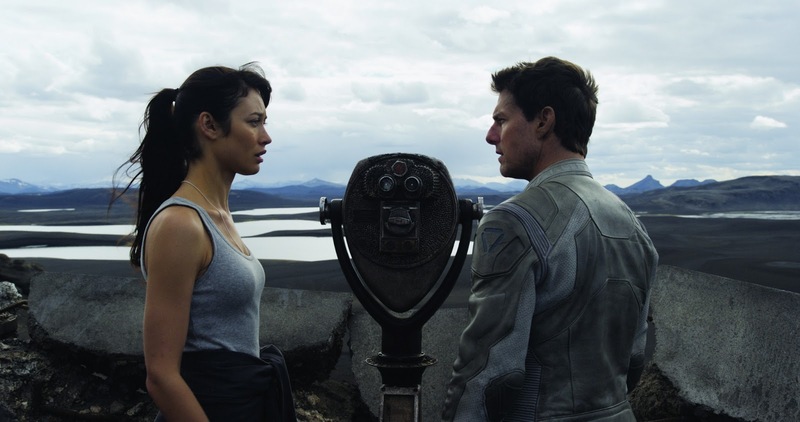 Let it be known, there are moments of greatness in the new sci-fi movie starring Tom Cruise, OBLIVION. But you've got to weed through some of the less impressive moments in the film to get to them. The premise is there: Cruise plays Jack, one half of a futuristic clean-up crew in charge of protecting the drones from the aliens that wiped out human civilization 60 years ago (the film is set in the year 2077). Jack's right hand woman, Victoria (Andrea Riseborough), is also his sort of girlfriend (or coworker with benefits?). She coordinates Jack's missions from the safety of their uber cool space loft using an even niftier computer that could have easily been borrowed from Minority Report (an earlier, better Cruise film). The beginning of the film pretty much shows off its sleek silvery glaze and special effects, and establishes the ambiguous relationship between Victoria and Jack, leading up to the first (of many) scenes where Jack's curiosity gets the best of him and almost costs him his life. Here's the thing: The more Jack wanders outside the domain of the mission, the more he begins to remember things about his distant past (before the apparent war that vanquished the planet). You notice right away that Victoria is deeply unsettled by his findings (however minimal and virtually unsupported, at first), which triggers an effective amount of tension in the movie. Jack's suspicions put him directly in the path of danger, and his first encounter with Julia (Olga Kurylenko), a survivor he recovers from a wreckage. Julia enters the film (roughly about a half hour in) is right around the time when it switches gears and moves from a standard fighting-off-killer-drones sci-fi film, to something that tries to be much deeper. All of a sudden, Jack's mission is questioned, along with his identity and the circumstances which brought him here. Then comes the long, choppy explanations of what could be happening and what could explain what Jack is really doing here. But, between his general hypothesizing and director Joseph Kosinski's ping pong with the plot (moving from Jack's vision of his reality and the actual reality of what is happening), it's difficult to grasp. It begins in a thrilling, plot-twisty kind of way, but evolves into a messy, you-lost-control-of-the-story kind of way. It's just not seamless. While the film fights desperately to tug at our heartstrings (and, to its credit, it succeeds at times), we're still unsure whether what we're watching is real. Things are made clearer when Beech (Morgan Freeman, in an off-kilter yet refreshing role for him) comes into the picture. Without giving too much away, he's the guy who puts all the pieces together in Jack's puzzle. Similar to the Morpheus character from The Matrix, Beech is the leader of a rebel crew Jack comes upon during one of his misguided adventures. Just when you think you have it all figured out (and are somewhat satisfied by it), Kosinski adds another piece to the puzzle. In an attempt to tie a bow on the film by employing a philosophical tone to the movie (only once suggested at its start), references to a book (the Bible? ), God, and how a man can die better take center stage. This is completely unnecessary, and only muddies an already shaky yet adequate execution. In fact, the film, which runs a bit over two hours, should probably end about 20 minutes before it does. Instead, we get a bunch of rambled explanations in droll sequences we could have done without. The performances range from effective to serviceable, with Kurylenko rounding out the latter end, sadly. While Julia's identity isn't revealed until near the end of the movie, Kurylenko does very little to add depth to the role. She should be the heart of the movie, but instead comes off surprisingly stale (especially coming off her far more absorbing portrayal in To the Wonder). Melissa Leo plays Sally, who literally lives inside of a computer the whole time, controlling the goings on of the Jack and Victoria partnership. Leo dons an inexplicable southern drawl and is completely underused in the role. Obviously, OBLIVION is not without its flaws. But its impeccable action scenes and stunning cinematography are where it thrives. Kosinski, who penned the screenplay (based on his own comic book) with Karl Gajdusek (Trespass) and Michael Arndt (Toy Story 3), struggles with the story, but does manage to create a glossy world where nothing is as it seems. It's a shame that its poor editing inhibits what could have been a memorable movie. OBLIVION is in theaters Friday. This one started well, built at a great pace, maintained my interest and then all of a sudden fell completely on its face at the end. It still a good film to see, however in my opinion it’s not a great movie.